I'm used to grasshoppers. Every summer I have been in southern Europe and I have fallen asleep to the strange squeals and screeches they make rubbing their legs. 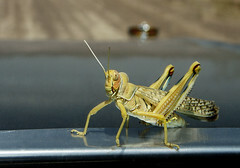 On the other hand, in 40 years I have never ever heard a single grasshopper in Scotland. Today is a very warm day - Léon and Lots are out in the garden playing in the paddling pool. Anna is naked on the grass... and to my utter amazement I have just heard a grasshopper in my garden in Glasgow!